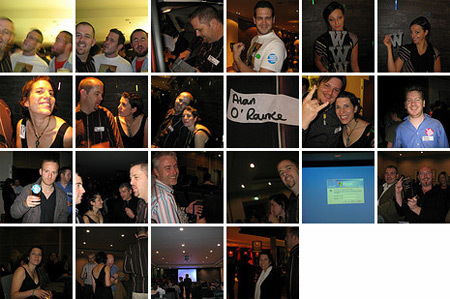 A fantastic night was had last weekend at the Irish Web Awards 08. It was the first one of these awards and a huge congrats to Damien Mulley for having the vision and drive to pull it together and to everyone who pitched in. It was one of the first award events I have attended where I felt it truly represented the current web industry in Ireland. Thanks to iQ content for sponsoring the category, Moviestar.ie for sponsoring the Awards and Peter Donegan Landscaping, Atfar Construction and Priority Engineering for sponsoring the drinks. It was great to meet and chat to everyone there and I was sorry I didnâ€™t get a chance to chat to so many others. Check the official site for links to other photos and videos of the night. i must be really honest here… I didn’t actually sponsor the drinks reception. I convinced John of Atfar Construction and Aidan of Priority engineering to do so and by default ended up receiving a lot of thank -you’s… I did however sponsor the best council website. Maybe a wise decision in the end not to have three sponsored drink sessions…?